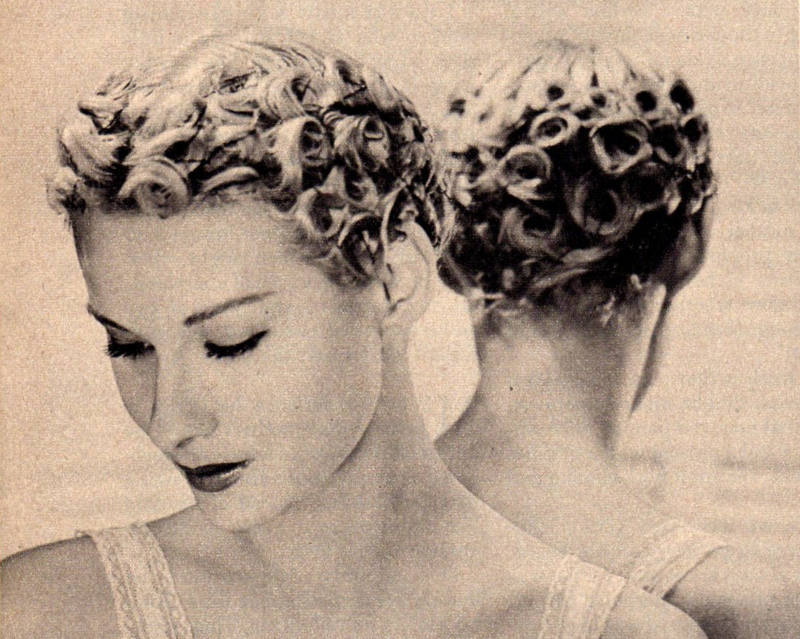 The Midvale Cottage Post: Hair-Dos from 1949 - Short and Sweet, Casual or Glamorous! 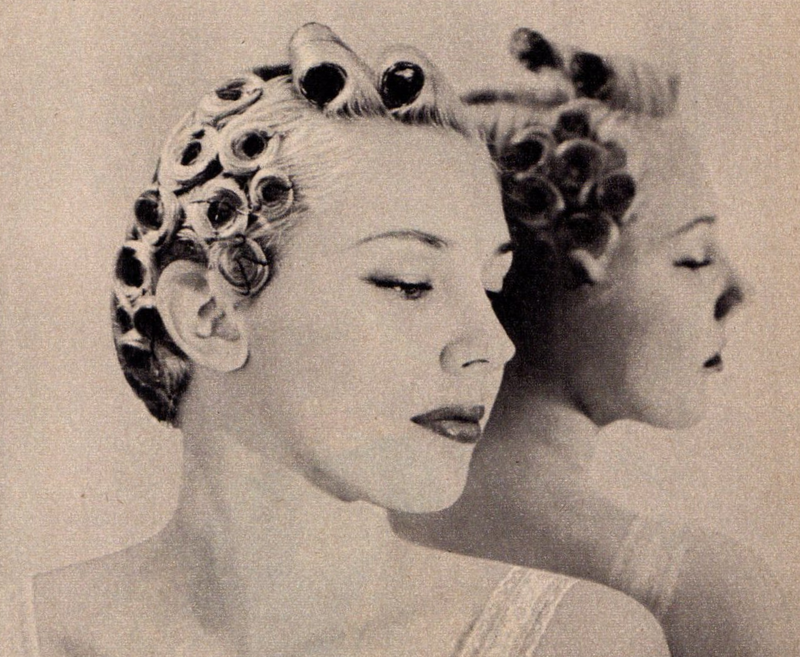 Hair-Dos from 1949 - Short and Sweet, Casual or Glamorous! 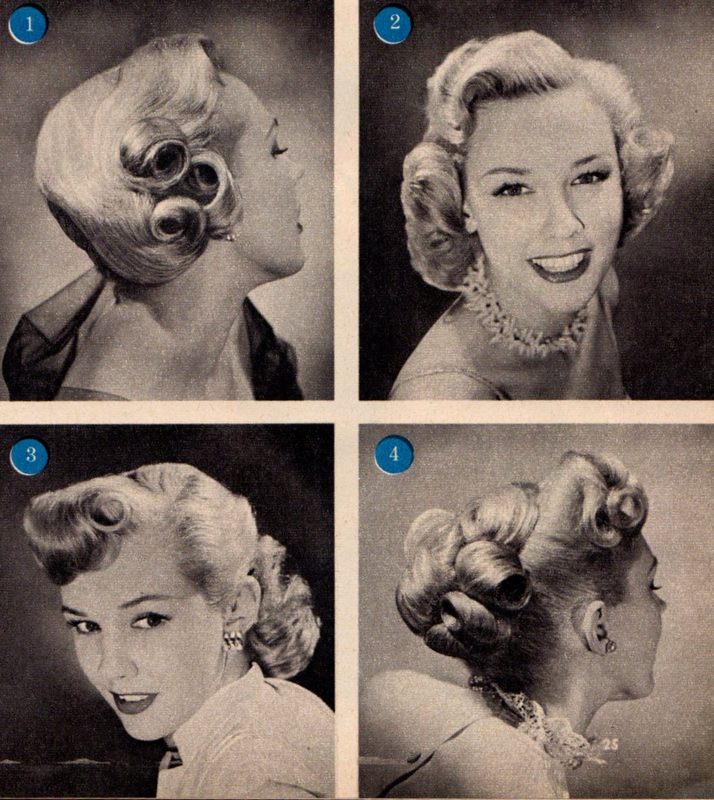 Straight from 1949 and Woman's Day magazine is an article that shows two different ways to set your hair with pin curls and instructions for brushing each into 4 charming hair-dos (for a total of 8!). Working with wet, freshly-shampooed hair, part in the center. Roll each pin curl tightly at ends, looser toward the roots, making each curl about the size of a quarter. Holding the curl firmly, stand it on its side and pin in place. Set 4 or 5 rows of flat pin curls on each side, rolling the curls toward the face. Keep the crown smooth and work around to the back (there should be 4 or 5 rows). Scramble the direction of the curls near the center back so that hair will not pull apart at that point. Be sure your hair is thoroughly dry before removing the hairpins. Angel-wing hair-do: hair is simply brushed up into soft curls. The front hair is combed into high coils. Smooth and close to the head: hair is brushed down until flat, then swirled toward the face. Brush the bangs straight to the front and let the part fall in. Then comb the coils toward the center of the forehead. A smart coif: Hair is parted on the right side. Brush the left side back and up. The brush the back hair high, and the right side back to meet it. A feminine evening hair-do: Part hair on the right and brush the right side back until it is sleek. At center back, start combing the back hair left and forward in feather edges. Comb the left side back over these feather curls. 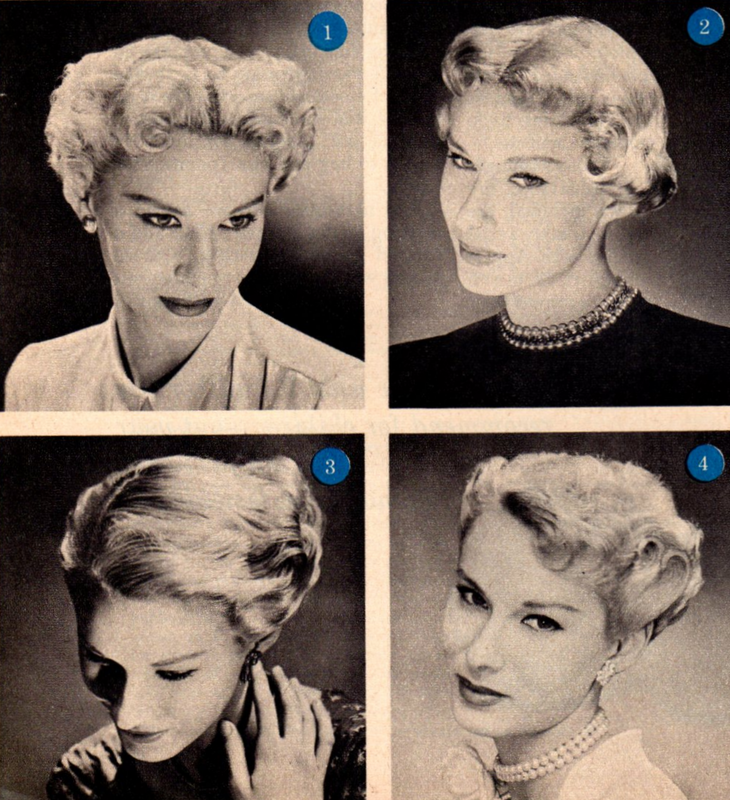 At top right, comb back one large curl. Brush the rest of the bangs to the left side. Comb the bottom section into a flat half-bang. Working with wet, freshly-shampooed hair, make two diagonal parts in the front (as shown), then roll back these sections (which are shorter than sides), using 3-inch rollers. Hold the rollers in place with a hairpin or two. Side hair and rest of front are set in flat pincurls about the size of a quarter. Roll hair from ends to roots, with ends tight and looser toward the roots. Make 3 rows on each side and starting at the ears, 2 rows across the back. Roll all curls toward the face. Near the center back, scramble the direction of the curls so the hair won't pull apart at that point. Be sure your hair is thoroughly dry before removing the pins and rollers. Formal hair-do: Hair on th eleft side is combed around the ear toward the face, then curved over the ear in one large puff. Back hair is combed to the right anbd held with comb behind the right ear. Front hair on the right side is combed back to meet it and also anchored. The combined ends are then swept over the right ear and arranged in 3 flat puffs, curved toward the face. Shorter hair at top front is combed into a deep, smooth wave. Sporty, all-around casual hair-do: First pin the front section up out of the way, as it is combed last. Start to comb the sides and back under, like a pageboy, but pull apart and soften the roll. To soften the left side, comb high and swing back. To comb front hair, fluff high, and then brush into a deep wave. Graceful chignon: Pin the front section up, then comb hair back in waves from sides. Anchor with combs. Fluff out the ends in a cluster of large soft curls. Comb the band forward, and swirl slightly toward the right side. A pretty version of the Psyche Knot and ideal for summer: Front hair is combed last as usual. Hair is swept up from the sides and back and hold with combs. Comb the center back curls (keep the rolls large and soft) and pin. Comb the side curls, arranging the rolls to surround the center. Front hair is swept up high, then combed back in a cluster of deep ringlets.